Torn Meniscus Surgery (Video) - Jeffrey H. Berg, M.D. doesn’t always need to be. Torn meniscus surgery is very effective and usually very safe. In another post, I discussed the reasons surgery may be needed. I also briefly reviewed the various torn meniscus surgery procedures. Now let’s look at them in more detail. When the meniscus tears, the torn pieces irritate the tissue (synovium) inside the knee, which causes local pain. The synovium also produces fluid in response to the irritation, just as your eyes produce tears when irritated. But unlike your eye, the knee is a closed space. So the fluid can’t drain away and it builds up instead. This increases the pressure in your knee, which increases your pain. Additionally, the loose flaps may get caught between the two bones of your knee joint. This may cause a popping or catching sensation, particularly with twisting or squatting. There are two procedures available for treating your symptomatic meniscal tear. Many meniscal tears will not heal on their own or even if stitched back together (repaired). The tissue may be degenerative, fragmented into small pieces, unstable and/or have a poor blood supply. Any of these will likely prevent the meniscal tear from healing. In these cases, the only torn meniscus surgery which is likely to resolve your symptoms is Meniscectomy (removing the torn meniscal tissue). In an earlier post, I discussed the importance of the meniscus in protecting the knee. Essentially, the less meniscus, the greater the forces between the end of the thighbone and the top of the shin bone and the earlier that these surfaces will wear out (arthritis). Since this is true, why would we ever want to remove any tissue. Won’t that lead to early arthritis? This is true, after meniscectomy, your knee will be at a greater risk of developing arthritis than had you not torn your meniscus. But once the meniscus tears and unless it can heal, not having a torn meniscus is no longer an option. The only two choices available are: 1) Leaving the symptomatic torn pieces in the knee or, 2) Removing them. Since the torn pieces aren’t working, leaving them doesn’t reduce your risk of arthritis. Likewise, removing them doesn’t increase your risk, but it does improve your symptoms. In actuality, a meniscectomy is a complete removal of the meniscus. This is rarely ever needed or performed. Typically, we perform a partial meniscectomy, only removing the torn tissue and leaving all remaining healthy meniscal tissue intact. In this way, we can reduce your risk of developing arthritis to the lowest level that it can be. See the video below to arthroscopic view of a partial meniscectomy. There are some tears that may heal if stitched together and stabilized. 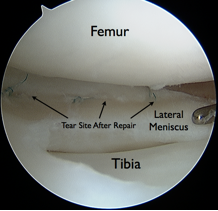 For these tears the correct torn meniscus surgery is a meniscal repair. There are a number of techniques. These are usually performed arthroscopically. During the procedures, sutures or small devices that incorporate sutures are used. Larger incisions may occasionally be needed. See the video below to view of an arthroscopic meniscal repair. Fortunately torn meniscus surgery performed in the correct patients, for the correct issues and performed by a sports medicine knee specialist, is often very successful and usually has a relatively simple recovery. So, if you’ve been diagnosed with a meniscal tear and you’ve been told you need torn meniscus surgery – Don’t worry…and don’t hesitate. Seek out a well-qualified surgeon and start getting back to your active lifestyle. I Have A Baker’s Cyst: Should I Worry?